Younger athletes suffer many of the same injuries as their adult counterparts. However, there are anatomical differences between adult and growing bone. The articular cartilage of a growing bone is a thicker layer than in adult bone and can remodel. 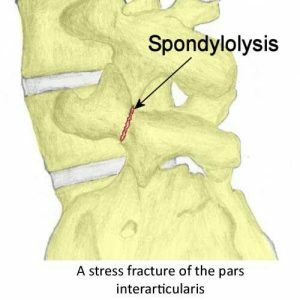 The metaphysis of long bones in children is more resilient and elastic, withstanding greater deflection without fracture. 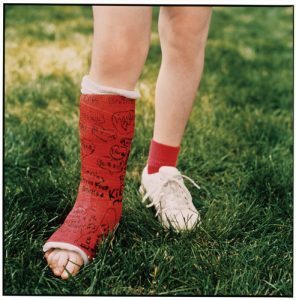 Thus, children tend to suffer incomplete fractures of the greenstick type, which do not occur in adults. During rapid growth phases, bone lengthens before muscles and tendons are able to stretch correspondingly and before the musculotendinous complex develops the necessary strength and coordination to control the newly lengthened bone. Common causes of back pain in the younger athlete are similiar to those in the mature adult. 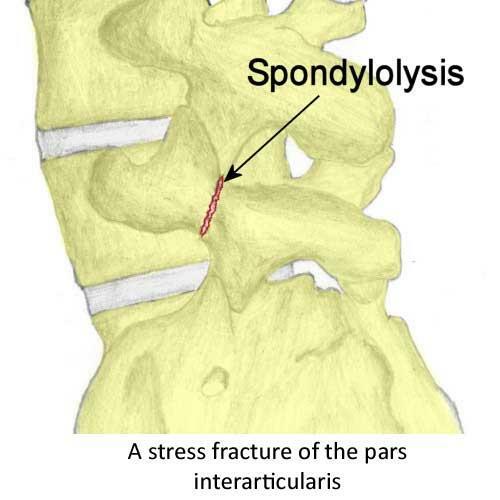 Stress fractures of the pars interarticularis (spondylolysis) may occur in the younger athlete, particularly because of repeated hyperextension of the lumbar spine. The commonest postural abnormality of the spine in the younger athlete is excessive kyphosis of the spine due to an osteochondrosis (Scheuermann’s lesion). Perthes’ disease is an osteochondrosis affecting the femoral head in the hip joint. It typically affects children between the ages of 4 and 10 years, is more common in males and may be recognised with delayed skeletal maturation. It presents as a limp or a low-grade ache in the thigh, groin or knee. Knee pain is one of the most common presentations in the young athlete. Osgood-Schlatters lesion is an osteochondritis that occurs at the growth plate of the tibial tuberosity (below the kneecap). This condition is extremely common in adolescents at the time of the growth spurt. It is usually associated with a high level of physical activity, especially in sports involving running and jumping where the repeated contraction of the quadriceps muscle mass is one of the main causes. Osteochondritis dissecans may also affect the knee. This gradually presents with intermittent pain and swelling of gradual onset. Occasionally, it may present as an acute painful locked knee. Sever’s lesion is a traction apophysitis of the insertion of the Achilles tendon to the calcaneus (heel). This typically occurs between the ages of 7 to 10 years and this is the second most common osteochondritis seen in the younger athlete after Osgood-Schlatter lesion. 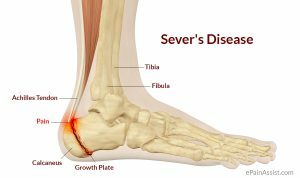 Sever’s lesion is often present at a time of rapid growth during which muscles and tendons become tighter as the bones become longer. At The SISM Clinic we see a lot of these common injuries in the young athlete on a regular basis and have developed rehabilitation protocols to successfully return the athlete to sport. No Comments to "Injuries in the Younger Athlete"